WEAPON DURABILITY HAS BEEN REMOVED FROM THE SYSTEM ^^ No need to edit your Weapon's stats, JUST DON'T PAY ANY ATTENTION TO WEAPON DURABILITY. XP Calculation has been updated. Stuns the target for 1 turn and deals Physical Damage. (Can only be done once per reaction phase) Has a 5 turn cooldown. ^^ An error on my part. Added Move cost and STM cost for Conjure guard. (All Conjurations do not use STM and starts with 1 MOVE. Stats increase with user's Weapon and Armor stats. Assign yourself to take hits in place of an ally. (can only protect one ally) Effect Lasts for 1 turn. Damage received will be equivalent to Defending. Assign yourself to take hits in place of a party. (can only protect oneparty) Effect Lasts for 1 turn. Damage received will be equivalent to Defending. Red Skill Set #12 has been added. I was talked into lowering the SP cost of all the skill that are level 99 and below. Please, if you have taken a skill below level 100 and costs 2 or more SP, then change it into 1. Also I have reduced the STM cost of most of the Red Skills. One more thing to look forward to is the DOUBLE XP event coming in chapter 3. Aside from the new XP formulas, I also wish to inform you that I will update your weapons and armors before we start chapter 3. So go levelup as fast as you can. RED, GREEN, BLUE Skills updated. I am going to change the forum address in an attempt to net more people.If you cannot find the site, contact me over at Gundam msl. Thats www.gundam-msl.forumotion.com. Stay posted. Once I've chosen a forum Address I will post the link here before I apply the following changes. 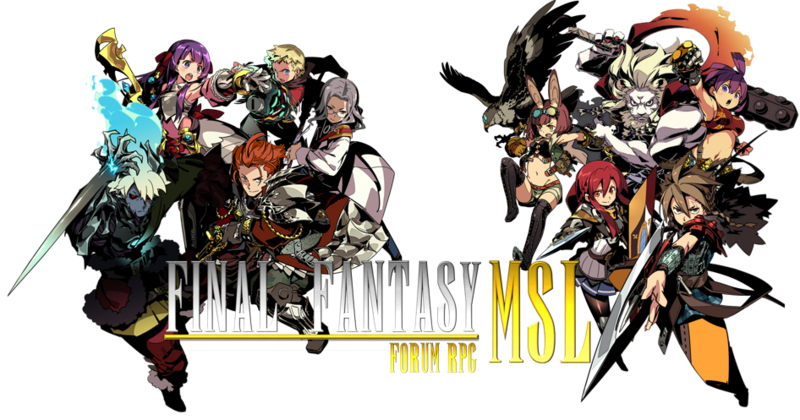 If you are lost, just search my name on google "ffmsl"
To everyone who doesn't have a mod yet. Please be patient I'm sure your respective mods will post soon. The stories I am moderating might lag a bit, because I'll working on the Advertisement itself and fixing some things on the site to make it look more appealing. Worry not about your STS, though. For I will be constantly monitoring and granting XP rewards despite my busy task schedule. If we're lucky, we'll get new players to join. The problem is I can only handle so much, alone. If my Moderators continue to be inactive, I shall be forced to demote them and look for new ones to take their place. Also I want everyone to support my advertisement once it's posted. Discover the power of the ancient arcane arts. Permanently adds 300 to MAG. Learn the secrets of the legendary, Bryan Shieldheart. Permanently adds 300 to your DEF. Learn from the Master Jugma Alfeirbane. Permanently adds 300 to your STR and adds a blueish glow to your weapon. Discover the power of this magical rune. Conjurations costs Half STM to conjure. Find the Dishonored and learn their secrets. Permanently adds 300 to your DEX.